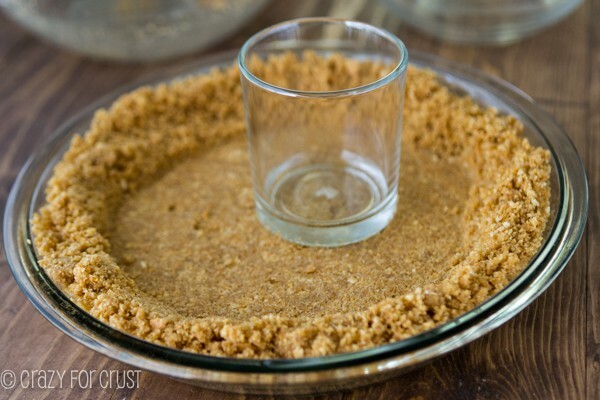 A graham cracker crust recipe for baked pies and no bake pies! We could also title this post The Anatomy of a Graham Cracker Crust. In other words, we’re making our own graham cracker crust from scratch today and it’ll be the best graham cracker crust you’ve ever had! You can use it for no-bake pies or you can bake it first. That’s a summer #win if you ask me! 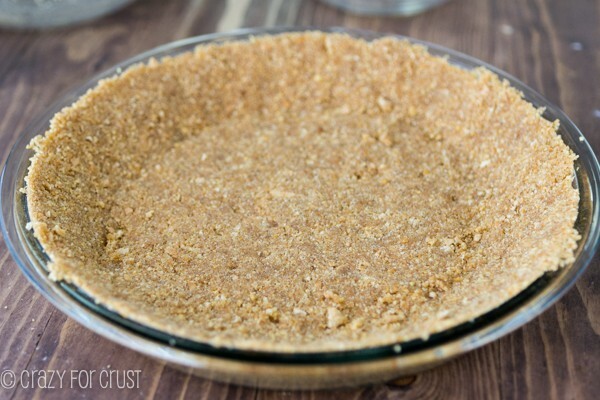 Graham cracker crust is one of my favorite pie crusts. I don’t think I can choose an absolute favorite, because I love all of them too much. 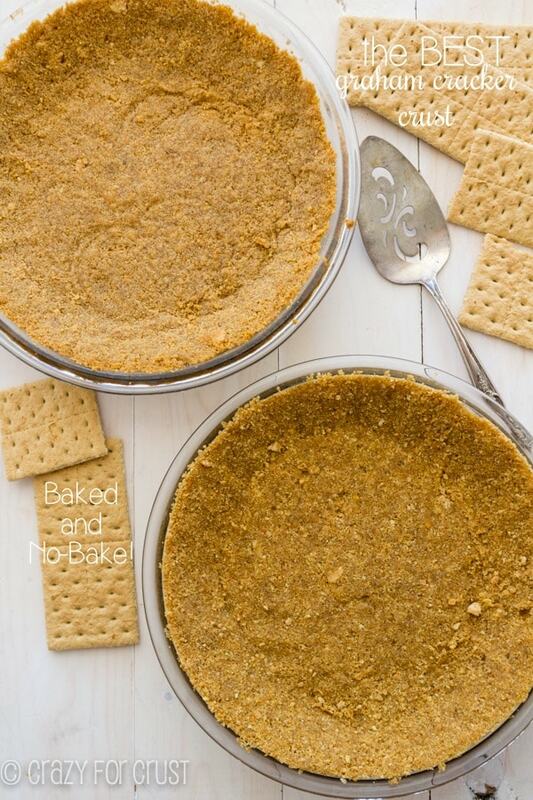 But a good graham cracker crust is a must have in your baking arsenal. So many pies can be made to pair with the graham cracker flavor because it’s so versatile. You can fill it with creamy s’mores chocolate pudding or even an easy blueberry-lemon dessert filling. I think everyone needs a from-scratch graham cracker crust recipe in their arsenal. What if you want a pie right now and can’t get to the store? And, let’s face it. As good as those store-bought crusts are, they sorta taste like the aluminum foil pie tin, right? Or is it just me? 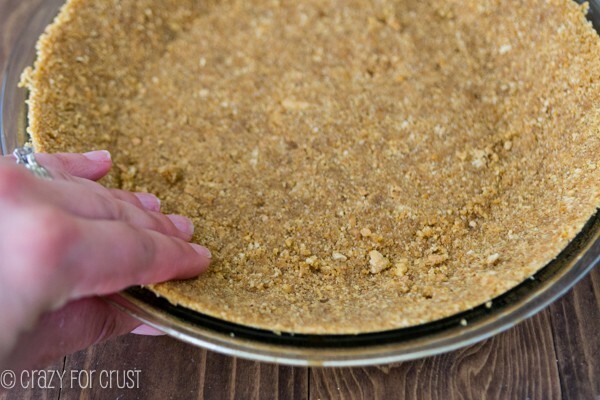 So today, I’m showing you my favorite from-scratch homemade graham cracker pie crust recipe. And this is even more perfect because you can use it for recipes that call for baking the crust OR you can use it no-bake. Because when it’s 106° like it has been this week in Sacramento, the last thing you want to do is turn on your oven. A no-bake pie is not, in fact, no-bake when you have to bake the crust for 10 minutes. This pie crust is good both ways. You can bake it if you want…or you can simply fill it. Either way, it’ll turn out yummy and crunchy, without any sort of tin aluminum flavor. Ready for the anatomy of the perfect graham cracker crust? So many things go into making this easy pie crust, so we have a photo-heavy post today. 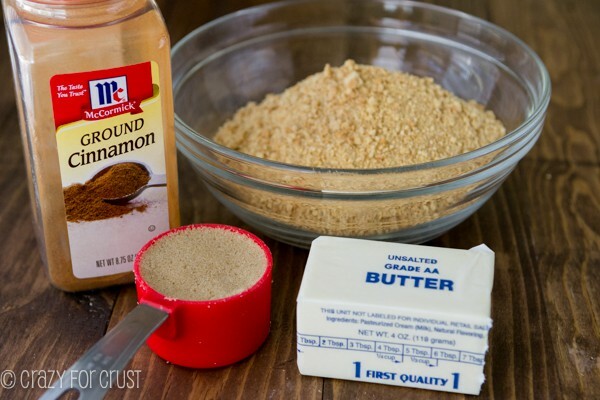 I’m showing you every step of the process, so you can be sure and make the perfect graham cracker crust too! First, you need graham crackers. Obviously. 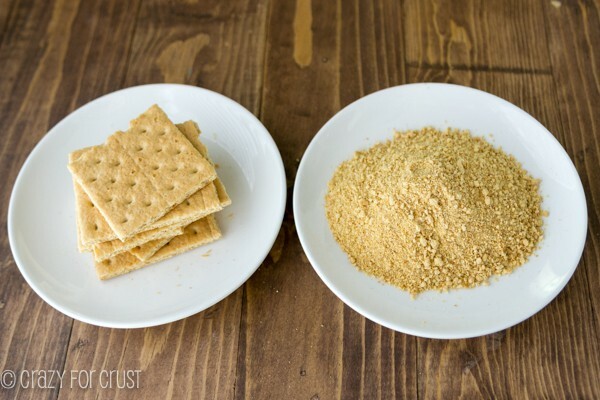 You have two different options when starting with graham crackers: whole and crumbs. One is cheaper, one is easier. Want to hear a dirty little secret? I use graham cracker crumbs 99% of the time. I’m lazy and I hate cleaning my food processor. Plus, I use them so often, it’s just easier. But in the interest of doing a step-by-step recipe for you, I decided to do a little test. Should you buy whole graham crackers? Or crumbs? It doesn’t matter. Not in the slightest! For both of the crusts I made for you today, I used generic graham crackers (regular, not low-fat) and Keebler Graham Cracker Crumbs. Keebler is the most recognizable brand, although some stores do sell generic versions. The only problem with using one or the other is what the recipe you’re using calls for. 5 whole sheets? 1 cup of crumbs? What if you’re using whole crackers but it calls for crumbs? How many do you crush? You can use that guide to adapt whatever recipe you’re using. Or, just use this one, because I included both measurements. Now, say you’re starting with whole graham crackers. Do you HAVE to have a food processor? NO! I tried crushing the crackers in my food processor and in a plastic bag using a rolling pin and, when compared with the store-bought crumbs, they were all exactly the same. Moral of the story: use your favorite graham cracker or crumbs, and crush them the easiest way for you. Next, let’s talk about ingredients and ratios. The graham cracker crust on the side of the box of Keebler Graham Cracker Crumbs uses 1 1/4 cups of crumbs to 1/3 cup melted butter. I used that recipe for my base (they know what they’re talking about, after all), but I changed it up to fit my needs. First, 1 1/4 cups of crumbs is great, but I like my crust THICK. I’m a crust girl, after all. I changed the amount of crumbs to 1 1/2 cups. But that also meant that I had to adjust the amount of butter. The trick to any crust is the amount of fat to other ingredients. This is especially true in a cookie or cracker crust (and even more so in no-bake crusts), because the butter is the binding agent. Too much butter = greasy. Not enough = it falls apart. I upped the amount of butter to 7 tablespoons (measured, then melted) for this recipe. Let’s talk about sugar for a second. 99% of recipes you see use granulated sugar. That’s fine, you can use that if you want. I like using brown sugar. Brown sugar is my favorite kind of sugar, and graham crackers are very brown sugary. It fits. I used unsalted butter so I added some salt (not pictured) and I also added cinnamon. Cinnamon gives the crust a little secret flavor that goes with just about everything. But, if you’re not a cinnamon person, you can leave it out. As in…it’s easy to mix your own crust. No mixer, no food processor needed. You don’t even need a wooden spoon. I mix all my dry ingredients with a fork. I like how a fork works for mixing together the crumbs, and then again when adding the butter. It makes it more crumbly somehow. It’s the texture of very coarse sand. You pour this mixture into a 9″ pie plate. Make sure you measure your plate. 9″ is standard, and I think this would even do well in a 9 1/2″ pie plate. But anything over (or under) that and you need to edit the recipe. 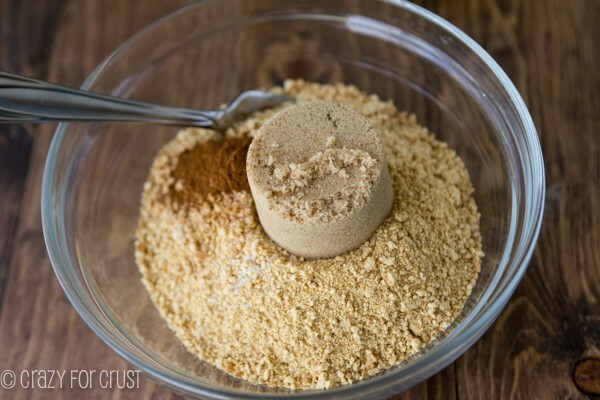 Another secret to the perfect graham cracker or cookie crust is compacting the crumbs. You need to really, really compact them, especially if you’re not baking it. I use the bottom of a glass for the bottom of the pie plate. Press it good! Then I use my fingers for the sides. Again, use a lot of pressure. Try to get it as even as possible. 1. Chill the crust for at least one hour before filling with your no-bake filling. Chill according to the recipe directions, then cut and serve. The crust is semi-crunchy and perfectly sweet. It may crumble a little more on cutting than the baked version, but it’ll hold together nicely. 2. Bake the crust for 10 minutes at 325°F. Let it cool completely, then fill and chill according to the recipe directions. A baked graham cracker crust will be more crunchy and be less crumbly, but you have to use your oven. There is a third option, which I haven’t tested yet, but I’m 99% sure it’ll work. You can also use this pie for a baked pie (like this one). It would be a combination of 1 and 2 above: chill the pressed crust while preparing the filling, then fill and bake according to recipe directions. 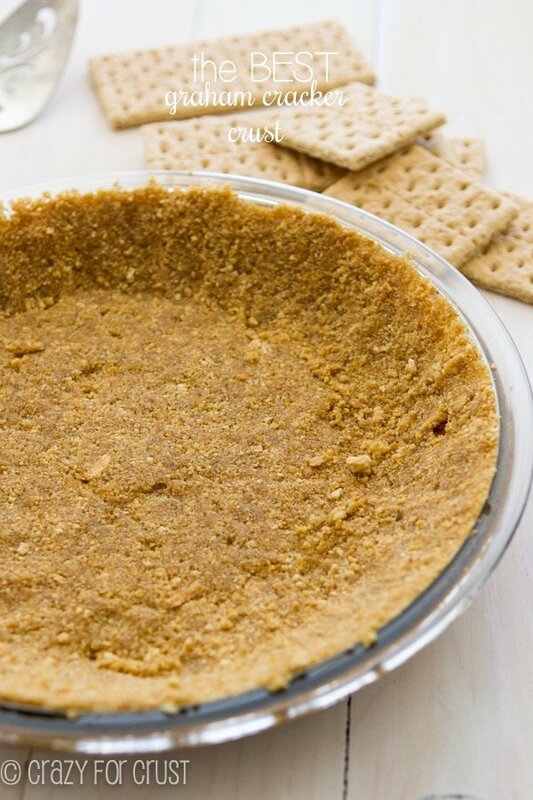 Either way you make it, this graham cracker crust is the best base for your pies. It’s easy, comes together in mere minutes, and tastes way better than packaged. Use real butter for best results. Butter substitutes and low fat butter will cause the recipe to be oily. Remember that 3 graham cracker sheets = approximately 1/2 cup crumbs. When this pie is made for a no bake pie it can be hard to slice the first piece. After that the pieces will come out easy. Use any kind of filling for this pie, like coconut cream, banana, peanut butter, or lemon. 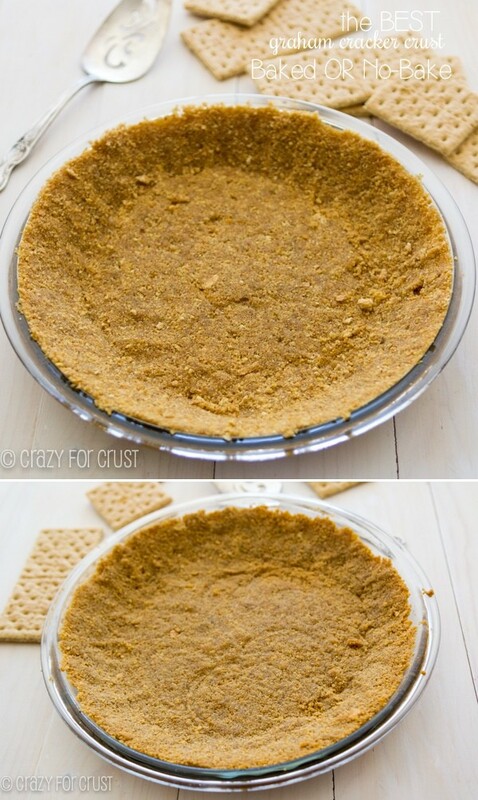 I can think of lots of options for this easy graham cracker crust. Come back tomorrow for one of them! 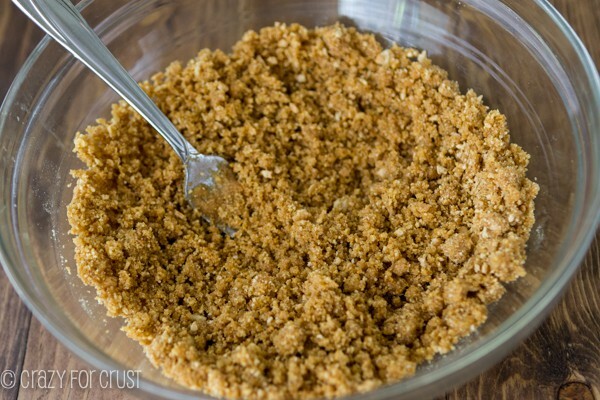 This is the BEST graham cracker pie crust - from scratch. It can be no-bake or baked depending on your mood. It's perfect! If you’re using whole graham crackers, finely crush them in a food processor or place them in a ziploc bag and roll with a rolling pin. Press mixture into the bottom and up the sides of a 9” pie plate. Press hard to compact. You can use a glass to press the bottom, but use your fingers to press the sides. To make a no-bake pie: Chill pie crust for at least one hour before filling. Cover if chilling longer. Make pie as directed. To make a baked graham crust: Preheat oven to 325°. Bake crust for 10 minutes, until it just starts to brown. Cool completely before filling. Tip: place graham crackers in a gallon size zip-top storage bag and seal. On a hard surface, place a thin stack of newspapers, a magazine, or a stack of scrap paper. Place bag containing graham crackers on top. Beat crackers with the flat side of a meat hammer until crumbs are of desired consistency. Continue with recipe as directed. This recipe is so easy and delicious. I may never buy another graham cracker crust again. How to keep a graham cracker crust firm after baking and chilling , then putting in it a cold lemon pie filling , topped with egg white meringue and graham cracker crumbs, then browning the meringue and crumbs? How do I keep crust from being soggy????? Your crust must be CRAZY buttery! I used half the (vegan) butter and it was still a little more than I prefer. Though I love the amount of cinnamon – it’s enough for that little extra flavor, but not so much that it’s overtly cinnamon-y. I have a tendency to overseason everything, so this was a really helpful guideline! I used chocolate teddy grahams to make a crust for a salted caramel chocolate tart, and baked the crust. It was perfect! Wound up using about a half tablespoon less butter.